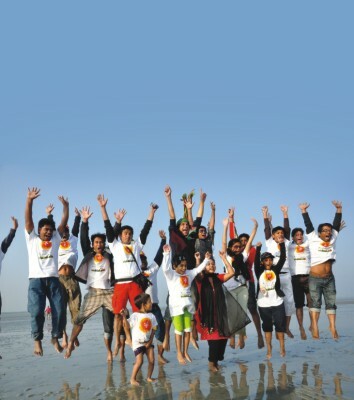 Shurjo Uthshab is an amazing initiative organized annually for the 31st by an adventurous lot from Bangladesh Astronomical Association since 2001. The aim is to absorb the amazing power of the first sun of the year bathing in its awesomeness and becoming super awesome human beings, while visiting and learning about various wonders and diversity within Bangladesh. After past events at Saint Martin, Keokradong Peak at Bandarban, Nujhum Dip, Panchagar, Birishiri, Tanguar Haor at Shunamganj, Pablakhali Forest at Rangamati and others, the 2010 festival was finally scheduled at the wondrous Sundarban with Channel I and bdnews24 helping out as media partners. On the 30th morning we found ourselves at Shadarghat surrounded by water as black as oil and stench that can easily compete with shutki, and boarding a Parabat-1 launch of 421 capacity for a group of roughly 140 with 109 participants. On board we struggled to lift a 30 feet bamboo, which would carry our emblem and flag for the journey; it was a green shaded huge patch of cloth with Kon-tiki's face stitched on it coming all the way from Charukola. Kon-tiki (or Con-tici Viracocha) is the all powerful creator of all things for the Inca civilization in the Andes of South America who was worshipped as the god of sun and of the storms and was represented as wearing the sun as a crown, thunderbolts in his hands and tears descending from his eyes as rain. Kon-tiki was also the name of the raft used by the Norwegian explorer, Thor Heyerdahl in his 1947 expedition from South America to the Polynesian Islands across the Pacific. Our flag was a tribute to him and to the Inca civilization. Keeping to the Bengali tradition of being late, we finally head out at ground-breaking water-shaking 18 kms/hr past Muktarpur's brick makers and Gojaria's dredgers and sand sellers as we moved from Buriganga river to Dhaleshwari to Charpur's mohona (confluence) where we finally met the great Meghna. A bunch of live chickens were also coming along with us to the forest where we would be feasting on them for our taste buds to be enriched and happy. Ahh, such is the human life. Anyways, with ample to feast on and proper introduction rounds amongst the group we head off to our ever vibrating free massaging deck with sleeping bags wrapping ourselves in 3 to 4 layers to fight the cold while the launch carried on its journey amidst the rising misty clouds of the waters. On the 31st we found ourselves waking up to the cry of the chickens and we were already at Rampal in Bagerhat. Our destination was Kotka past Heron Point on the southern edge of the Sundarban, which continues onto the Bay of Bengal. Kotka is supposedly to contain the most number of tigers in Bangladesh's side of Sundarban but hoping to see one in such a short trip would be like hoping to get rid of corruption in Bangladesh over night. Tigers tend to normally mark their territory and in every 30 to 40 kms there are usually 1 or 2 of them. Oh and if you ever visit the Sundarban and happen to see a lungi hanging in the forest out of nowhere, stay out of that place; the lungi means that a person was a meal for a tiger right there. Cute little vicious creatures that they are. At this point I should probably mention that we were way off the itinerary that was given to us due to some mismanagement and because taking such a huge launch to Sundarban with a not so experienced pilot (which was the case) is kind of stupid but the trip ended up being quite an adventure. We reached Mongla's Poshur river on the second day past Bashundhara LPG, Elephant Brand Cement Factories, EPZ and the famous Banishanta area. In the meanwhile preparations were being made for the 31st night that we would be celebrating out of network isolated from the world floating on the rivers! Not that an attractive proposition is it? Oh we also had a theme song for the trip; we had Momtaz's beat filled super dhishting dhishting song “Pankha” playing almost on repeat which was a big hit in the ship. Soon it was midnight! As you know, thanks to our beautiful government, we had the opportunity to celebrate New Year twice this year. Yippie! Kind of verbally contradicting isn't it? Anyway, we celebrated the first new year with candles and songs honouring our country only to turn back the clock time an hour and celebrate it again floating colour paper covered candles and prodips on clay pots down the Poshur river. It was quite a site to be held really watching them struggle against the wind and waves as the water reflected their tiny light and eventually consuming them. Then came back Momtaz with “Pankha” and “Nantu Ghotak” and the dancing lot danced away in the launch into 2010 while the rest of us covered up and stared at the amazing full moon on the roof the launch. The 1st was the third day on the boat and people were getting anxious by now to get to land. However, we were inside of Sundarban by then and we could easily see the devastations of Cyclone Aila; sundari trees broken down and dying and patches of empty land here and there. We made our way through the curvy rivers of the forest barely avoiding a few accidents, and into the Bay of Bengal past Dublar Char and Heron Point towards Kotka. Only a few hours away from Kotka, on the brink of joar and starting of bhata, all of a sudden our launch got stuck in a char. For those of you who are not aware, joar is when the water level rises and bhata is when it drains, and this happens in the area we got stuck every 6 hours rotationally. With the full moon pulling the massive water body, the bhata was a gigantic one and soon all the water were drained and we found our launch stranded on a beach where we got down and conducted an art installation project that we were of supposed to do in Kotka. After bhata, when the joar comes, it comes fast and apparently this was the place where 11 students had died a few years ago in a similar situation. Luckily that didn't happen to us and we also came to know that the char was still unnamed and is part of the new land rising in Bangladesh. So what do we name it? Yes! Pankhar Char! After sunset we were fire spinning and breathing out in Pankhar Char when we finally decided that water was pouring back in and we rushed back to the launch. Three hours into the joar and 10.5 hours of getting stuck when we could finally move we decided that it was too late to go to Kotka and we started heading back and that is when we wonderfully got lost in the Bay of Bengal. After a night of not knowing where we were and getting angry like hungry squirrels and frustrated like cheka khawa teenagers, at noon we finally found our location and by 2 we were Karamjal, Dacob. Remember the case where 18 crocodile babies we stolen in November; that happened in Karamjal. 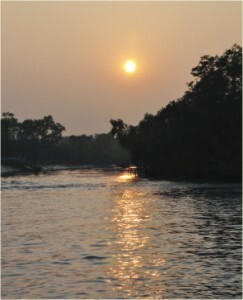 Karamjal is a crocodile breeding center and forest research station in the Sundarban. Finally on land, we caught glimpses of mangling monkeys, sleepy crocodiles and shy deer, bought some 'action' honey (mixed with sugar sap) before we started heading back for Dhaka. Later on asking the pilot he mentioned that there are several missing boyabati (guiding lights) along the route and the ones that are there have many of their solar panels stolen, which creates a lot of problems and anyone not having adequate experience in the waters get lost. From Mongla to Heron Point, there are only 2 boyabati in the 60 km route and no warnings of potential char areas. The program also included an art competition for the little kids on board and their parents, a raffle draw with awesome prizes (trips for 2 for 2 nights to Saint Martin, Nijhum Dip and Bandarban), a question and answer round also with awesome prizes (bodnas and tissue papers) and finally a discussion on '71 where Millie Rahman, wife of birsreshtho Matiur Rahman, talked about their experiences, sacrifices and struggles during the liberation. The whole trip made strong bonds between the many people. The adventure was exhausting but exhilarating and Bangladesh Astronomical Association certainly deserve applause for arranging such a trip. Shurjo Utshob takes place every year from 30th December to the 3rd of January. If you have the stamina, a few strong bones and are ready to waste a few comfortable nights for an adventure, please do come along. You are bound to love it!